VMFA-142 was a reserve aviation unit of the United States Marine Corps active from 1942 to 2008. The squadron was based at Naval Air Station Atlanta, Georgia and fell under the command of Marine Aircraft Group 42 (MAG-42), 4th Marine Aircraft Wing (4th MAW). Due to a re-organization within Marine aviation, the squadron moved from Naval Air Station Fort Worth Joint Reserve Base, Texas and was placed in a cadre status under Marine Aircraft Group 41. 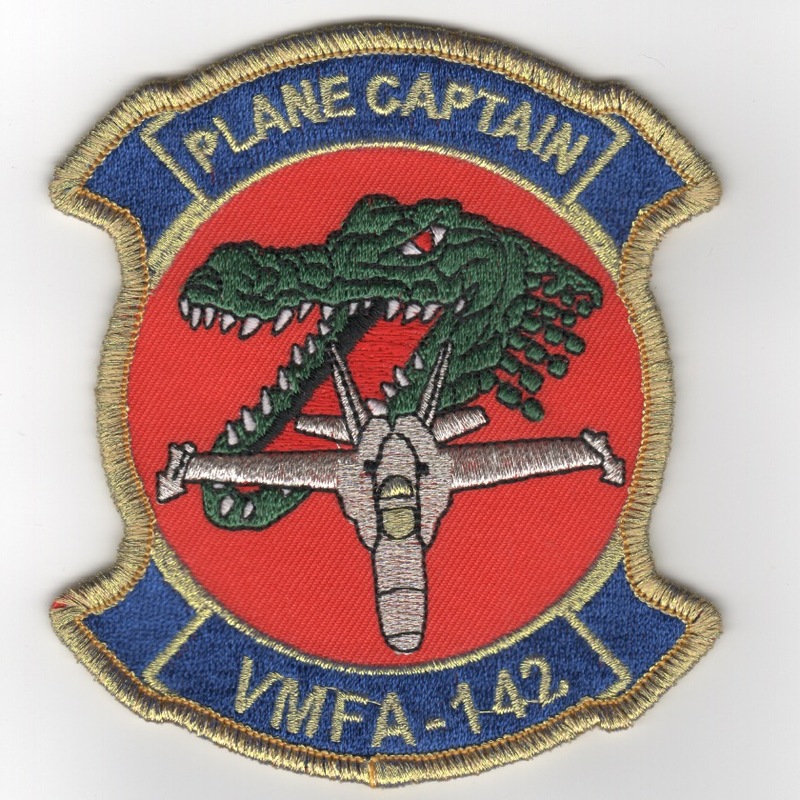 A little history.....after WWII, they were recommisioned as a reserve squadron.Ê Later on, 142 was combined with VMF-144, but the squadron remained VMF-142 even though they carried over 144's nickname of the "Flying Gators".Ê Being in Florida, and most of the personnel were college students from the Univeristy of Florida, the squadron became known as the Flying Gators.....This is their Squadron patch. This patch does not come with Velcro. VMFA-142 was a reserve aviation unit of the United States Marine Corps active from 1942 to 2008. The squadron was based at Naval Air Station Atlanta, Georgia and fell under the command of Marine Aircraft Group 42 (MAG-42), 4th Marine Aircraft Wing (4th MAW). Due to a re-organization within Marine aviation, the squadron moved from Naval Air Station Fort Worth Joint Reserve Base, Texas and was placed in a cadre status under Marine Aircraft Group 41. 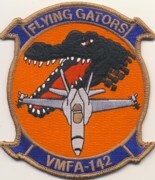 A little history.....after WWII, they were recommisioned as a reserve squadron.Ê Later on, 142 was combined with VMF-144, but the squadron remained VMF-142 even though they carried over 144's nickname of the "Flying Gators".Ê Being in Florida, and most of the personnel were college students from the Univeristy of Florida, the squadron became known as the Flying Gators.....This is their 'Plane Captain' patch with the "GOLD" border and does not come with velcro attached. Homepage | Order VMFA-142 Patches!